NCERT Solutions for Class 10 Math Chapter 7 Coordinate Geometry are provided here with simple step-by-step explanations. These solutions for Coordinate Geometry are extremely popular among class 10 students for Math Coordinate Geometry Solutions come handy for quickly completing your homework and preparing for exams. All questions and answers from the NCERT Book of class 10 Math Chapter 7 are provided here for you for free. You will also love the ad-free experience on Meritnation’s NCERT Solutions. All NCERT Solutions for class 10 Math are prepared by experts and are 100% accurate. Find the distance between the points (0, 0) and (36, 15). Can you now find the distance between the two towns A and B discussed in Section 7.2. Yes, we can find the distance between the given towns A and B. Assume town A at origin point (0, 0). Therefore, town B will be at point (36, 15) with respect to town A. Determine if the points (1, 5), (2, 3) and (− 2, − 11) are collinear. Let the points (1, 5), (2, 3), and (−2, −11) be representing the vertices A, B, and C of the given triangle respectively. Therefore, the points (1, 5), (2, 3), and (−2, −11) are not collinear. Check whether (5, − 2), (6, 4) and (7, − 2) are the vertices of an isosceles triangle. Let the points (5, −2), (6, 4), and (7, −2) are representing the vertices A, B, and C of the given triangle respectively. As two sides are equal in length, therefore, ABCis an isosceles triangle. In a classroom, 4 friends are seated at the points A, B, C and D as shown in the following figure. Champa and Chameli walk into the class and after observing for a few minutes Champa asks Chameli, “Don’t you think ABCD is a square?” Chameli disagrees. Using distance formula, find which of them is correct. 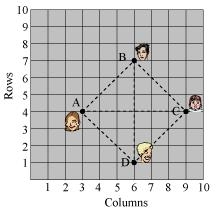 It can be observed that A (3, 4), B (6, 7), C (9, 4), and D (6, 1) are the positions of these 4 friends. It can be observed that all sides of this quadrilateral ABCD are of the same length and also the diagonals are of the same length. (i) Let the points (−1, −2), (1, 0), (−1, 2), and (−3, 0) be representing the vertices A, B, C, and D of the given quadrilateral respectively. It can be observed that all sides of this quadrilateral are of the same length and also, the diagonals are of the same length. Therefore, the given points are the vertices of a square. (ii)Let the points (− 3, 5), (3, 1), (0, 3), and (−1, −4) be representing the vertices A, B, C, and D of the given quadrilateral respectively. It can be observed that all sides of this quadrilateral are of different lengths. Therefore, it can be said that it is only a general quadrilateral, and not specific such as square, rectangle, etc. (iii)Let the points (4, 5), (7, 6), (4, 3), and (1, 2) be representing the vertices A, B, C, and D of the given quadrilateral respectively. It can be observed that opposite sides of this quadrilateral are of the same length. However, the diagonals are of different lengths. Therefore, the given points are the vertices of a parallelogram. Find the point on the x-axis which is equidistant from (2, − 5) and (− 2, 9). We have to find a point on x-axis. Therefore, its y-coordinate will be 0. Let the point on x-axis be . By the given condition, these distances are equal in measure. Therefore, the point is (− 7, 0). Find the values of y for which the distance between the points P (2, − 3) and Q (10, y) is 10 units. It is given that the distance between (2, −3) and (10, y) is 10. If Q (0, 1) is equidistant from P (5, − 3) and R (x, 6), find the values of x. Also find the distance QR and PR. Therefore, point R is (4, 6) or (−4, 6). Find a relation between x and y such that the point (x, y) is equidistant from the point (3, 6) and (− 3, 4). Point (x, y) is equidistant from (3, 6) and (−3, 4). Find the coordinates of the point which divides the join of (− 1, 7) and (4, − 3) in the ratio 2:3. Therefore, the point is (1, 3). Find the coordinates of the points of trisection of the line segment joining (4, − 1) and (− 2, − 3). Therefore, point P divides AB internally in the ratio 1:2. Point Q divides AB internally in the ratio 2:1. To conduct Sports Day activities, in your rectangular shaped school ground ABCD, lines have been drawn with chalk powder at a distance of 1 m each. 100 flower pots have been placed at a distance of 1 m from each other along AD, as shown in the following figure. Niharika runs the distance AD on the 2nd line and posts a green flag. Preet runs the distance AD on the eighth line and posts a red flag. What is the distance between both the flags? If Rashmi has to post a blue flag exactly halfway between the line segment joining the two flags, where should she post her flag? It can be observed that Niharika posted the green flag at of the distance AD i.e., m from the starting point of 2nd line. Therefore, the coordinates of this point G is (2, 25). Similarly, Preet posted red flag at of the distance AD i.e., m from the starting point of 8th line. Therefore, the coordinates of this point R are (8, 20). The point at which Rashmi should post her blue flag is the mid-point of the line joining these points. Let this point be A (x, y). Therefore, Rashmi should post her blue flag at 22.5m on 5th line. Find the ratio in which the line segment joining the points (− 3, 10) and (6, − 8) is divided by (− 1, 6). Let the ratio in which the line segment joining (−3, 10) and (6, −8) is divided by point (−1, 6) be k : 1. Find the ratio in which the line segment joining A (1, − 5) and B (− 4, 5) is divided by the x-axis. Also find the coordinates of the point of division. Let the ratio in which the line segment joining A (1, −5) and B (−4, 5) is divided by x-axisbe . Therefore, the coordinates of the point of division is . We know that y-coordinate of any point on x-axis is 0. Therefore, x-axis divides it in the ratio 1:1. If (1, 2), (4, y), (x, 6) and (3, 5) are the vertices of a parallelogram taken in order, find x and y. Let (1, 2), (4, y), (x, 6), and (3, 5) are the coordinates of A, B, C, D vertices of a parallelogram ABCD. Intersection point O of diagonal AC and BD also divides these diagonals. Therefore, O is the mid-point of AC and BD. Let the coordinates of point A be (x, y). Mid-point of AB is (2, −3), which is the center of the circle. If A and B are (− 2, − 2) and (2, − 4), respectively, find the coordinates of P such that and P lies on the line segment AB. The coordinates of point A and B are (−2, −2) and (2, −4) respectively. Point P divides the line segment AB in the ratio 3:4. Find the coordinates of the points which divide the line segment joining A (− 2, 2) and B (2, 8) into four equal parts. From the figure, it can be observed that points P, Q, R are dividing the line segment in a ratio 1:3, 1:1, 3:1 respectively. Let (3, 0), (4, 5), (−1, 4) and (−2, −1) are the vertices A, B, C, D of a rhombus ABCD. In each of the following find the value of ‘k’, for which the points are collinear. (i) For collinear points, area of triangle formed by them is zero. (ii) For collinear points, area of triangle formed by them is zero. Find the area of the triangle formed by joining the mid-points of the sides of the triangle whose vertices are (0, − 1), (2, 1) and (0, 3). Find the ratio of this area to the area of the given triangle. Let the vertices of the triangle be A (0, −1), B (2, 1), C (0, 3). Let the vertices of the quadrilateral be A (−4, −2), B (−3, −5), C (3, −2), and D (2, 3). 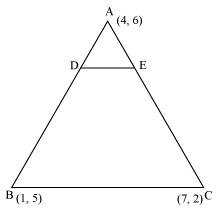 Join AC to form two triangles ΔABC and ΔACD. Let the vertices of the triangle be A (4, −6), B (3, −2), and C (5, 2). Let D be the mid-point of side BC of ΔABC. Therefore, AD is the median in ΔABC. However, area cannot be negative. 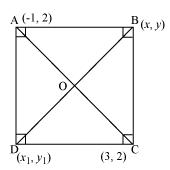 Therefore, area of ΔABD is 3 square units. However, area cannot be negative. Therefore, area of ΔADC is 3 square units. Clearly, median AD has divided ΔABC in two triangles of equal areas. Let the given line divide the line segment joining the points A(2, −2) and B(3, 7) in a ratio k : 1. Therefore, the ratio in which the line 2x + y − 4 = 0 divides the line segment joining the points A(2, −2) and B(3, 7) is 2:9. Find a relation between x and y if the points (x, y), (1, 2) and (7, 0) are collinear. If the given points are collinear, then the area of triangle formed by these points will be 0. This is the required relation between x and y. Find the centre of a circle passing through the points (6, − 6), (3, − 7) and (3, 3). Let O (x, y) be the centre of the circle. And let the points (6, −6), (3, −7), and (3, 3) be representing the points A, B, and C on the circumference of the circle. Therefore, the centre of the circle is (3, −2). The two opposite vertices of a square are (− 1, 2) and (3, 2). Find the coordinates of the other two vertices. Let ABCD be a square having (−1, 2) and (3, 2) as vertices A and C respectively. Let (x, y), (x1, y1) be the coordinate of vertex B and D respectively. We know that the sides of a square are equal to each other. We know that in a square, all interior angles are of 90°. We know that in a square, the diagonals are of equal length and bisect each other at 90°. Let O be the mid-point of AC. Therefore, it will also be the mid-point of BD. Therefore, the required coordinates are (1, 0) and (1, 4). The class X students of a secondary school in Krishinagar have been allotted a rectangular plot of land for their gardening activity. Saplings of Gulmohar are planted on the boundary at a distance of 1 m from each other. 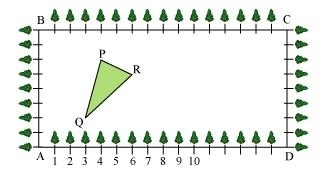 There is a triangular grassy lawn in the plot as shown in the following figure. The students are to sow seeds of flowering plants on the remaining area of the plot. (ii) What will be the coordinates of the vertices of Δ PQR if C is the origin? Also calculate the areas of the triangles in these cases. What do you observe? (i) Taking A as origin, we will take AD as x-axis and AB as y-axis. It can be observed that the coordinates of point P, Q, and R are (4, 6), (3, 2), and (6, 5) respectively. (ii) Taking C as origin, CB as x-axis, and CD as y-axis, the coordinates of vertices P, Q, and R are (12, 2), (13, 6), and (10, 3) respectively. It can be observed that the area of the triangle is same in both the cases. Therefore, D and E are two points on side AB and AC respectively such that they divide side AB and AC in a ratio of 1:3. Clearly, the ratio between the areas of ΔADE and ΔABC is 1:16. We know that if a line segment in a triangle divides its two sides in the same ratio, then the line segment is parallel to the third side of the triangle. These two triangles so formed (here ΔADE and ΔABC) will be similar to each other. Hence, the ratio between the areas of these two triangles will be the square of the ratio between the sides of these two triangles. Let A (4, 2), B (6, 5) and C (1, 4) be the vertices of ΔABC. (i) Median AD of the triangle will divide the side BC in two equal parts. 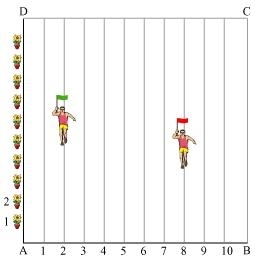 Therefore, D is the mid-point of side BC. 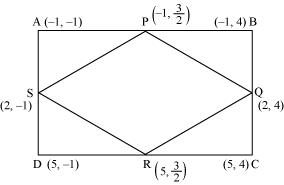 (ii) Point P divides the side AD in a ratio 2:1. 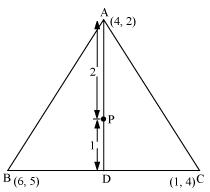 (iii) Median BE of the triangle will divide the side AC in two equal parts. Therefore, E is the mid-point of side AC. Point Q divides the side BE in a ratio 2:1. Median CF of the triangle will divide the side AB in two equal parts. Therefore, F is the mid-point of side AB. Point R divides the side CF in a ratio 2:1. (iv) It can be observed that the coordinates of point P, Q, R are the same. Therefore, all these are representing the same point on the plane i.e., the centroid of the triangle. Median AD of the triangle will divide the side BC in two equal parts. Therefore, D is the mid-point of side BC. Let the centroid of this triangle be O. Point O divides the side AD in a ratio 2:1. ABCD is a rectangle formed by the points A (− 1, − 1), B (− 1, 4), C (5, 4) and D (5, − 1). 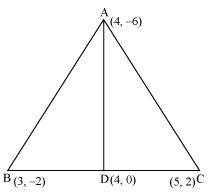 P, Q, R and S are the mid-points of AB, BC, CD, and DA respectively. Is the quadrilateral PQRS is a square? a rectangle? or a rhombus? Justify your answer. It can be observed that all sides of the given quadrilateral are of the same measure. However, the diagonals are of different lengths. Therefore, PQRS is a rhombus.